Like the Mont Canigou that unveils its summit in the background, Rivesaltes wines perfectly marry warmth and freshness. Whether garnet, rosé, amber or tawny colored, they naturally stand out with their strength and character. 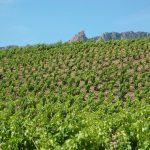 The 4000-acre vineyard for Rivesaltes wines spans over 86 communes in the Eastern Pyrenees and 9 in the Aude department on the border with the Eastern Pyrenees. The Aude also borders on the Mediterranean to the East, the Albères range on the South and the foothills of the Canigou on the West. Rosé wines: Black Grenache, Grey Grenache, White Grenache, Macabeu, Tourbat called Malvoisie du Roussillon, Small Grape Muscat, Alexandria Muscat. The vines grow on all the terroirs in Roussillon, including, among others: sandy granitic and gneissic soil, black and brown schist in the Fenouillèdes mountain range in the NorthWest, red limestone-clay and lime at the foothills of the Corbières, sandy clay, in the Aspres and rocky terraces along the rivers, gneiss and siliceous clay in the Albères. Rivesaltes Grenat: Full-bodied wines with rich cherry and blackberry flavors. Rivesaltes Ambré: Complex wines with notes of preserved orange, spice cake, dried fruit, caramel and sweet spices. Rivesaltes Rosé: fresh, young wines, with echoes of currants, blueberries and grenadine. Rivesaltes Hors d’Age: mention reserved for Rivesaltes Ambré or Tuilé matured for a minimum of 5 years. Rivesaltes Rancio: mention reserved for Rivesaltes Ambré ou Tuilé ; “Rancio” taste (nuts, dried fruit…) acquired through age and maturation. Gold was found in Roussillon under the form of Muscat de Rivesaltes. Sun-basked grapes produce an exceptional nectar with infinite flavors and mellowness. The Muscat de Noël is the first Muscat of the year with a beautiful youth. The Appellation covers 90 communes in the Eastern Pyrenees and 9 communes in Aude, the department over the border with the Eastern Pyrenees. It also faces the Mediterranean to the East, Spain to the South and West to the foothills of the Canigou. Muscat de Rivesaltes are white wines from Muscat à petits grains and Muscat d’Alexandrie. All the terroirs in Roussillon, including: sandy granitic and gneissic soil, black and brown schist in the Fenouillèdes mountains in the NorthWest, red limestone-clay and limestone at the foothills of the Corbières, sandy clay in the Aspres and rocky terraces along the rivers, gneiss and siliceous clay in the Albères, grey schist in the terroirs of Collioure and Banyuls. Strong and intense, the Alexandria Muscat provides fullness and flavors of ripe fruit, fresh grapes and roses. Light and fresh, the Small Grape Muscat brings scents of exotic fruits and citrus. Young Muscats are pale gold, with echoes of peach, lemon, mango and mint. After several years, their golden robe becomes deeper and their flavors evolve into notes of honey and preserved apricot. Maury wines draw their distinctive character from the steep hills of the Pays Cathare and its untamed nature, hence a very unusual aromatic intensity. These wines are an exclusivity of 4 communes in the Eastern Pyrenees, NorthWest of Perpignan (Maury, Tautavel, Saint-Paul de Fenouillet, Rasiguères). The vineyard is about 800 acres. For Grenat and Tuilé wines, the main varietals are Black Grenache, White Grenache, Grey Grenache. Auxiliary varietals are Black Carignan, Syrah, Macabeu. For White and Ambré wines, the authorized varietals are Grey and White Grenaches, Macabeu, Tourbat, Muscat d’Alexandrie, Muscat à petits grains. Maury vineyards are spread over black marl and black schist hills surrounded by the garrigue. Maury Grenat: Strong wines, complex on notes of black fruit and garrigue. Maury Tuilé: 30 months minimum maturation in an oxidizing environment. Wines with echoes of dried fruit, cacao and coffee. Maury Whites: Wines with notes of white-fleshed fruit and citrus that evolve over time into flavors of syrupy preserved fruit. Maury Rancio: acquisition of “Rancio” taste through maturation and aging. When the sea waves break against the Banyuls rocky shore, foam glistens in the light. The same mysterious alchemy occurs with Banyuls and Banyuls Grand Cruwhich combine power and subtlety for the enjoyment of wine lovers. 4 communes in the Eastern Pyrenees at the extreme East of the Pyrenees chain are the cradles of these treasures: Collioure, Port-Vendres, Banyuls-sur-Mer and Cerbère. The vineyard is 2500 acres large. Banyuls wines can be White, Rosé, Rimage, Ambré or Tuilé. Banyuls Grand Cru is only Tuilé. Complementary varietals: Carignan black, Cinsault, Syrah. Grey schist soil from the Cambrian period. 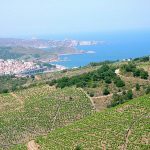 The vines are established on steep slopes with narrow terraces retained by low walls, facing the sea. Banyuls “Rimage” or Rimage “mise tardive”: Complex and elegant wines with notes of small, dark fruit, delicately gourmand. Banyuls Ambré, Tuilé: wines with notes of preserved fruit, figs and prunes. Banyuls White: wines with floral notes, mixed with citrus and white fruit. Banyuls Rosé: young and fresh wines, with notes of currants, blueberries and grenadine. Banyuls Grand Cru: these wines develop flavors of stewed fruit, spices, mocha, tobacco …; Banyuls Grand Cru can have mentions “Dry”, “Sec” or “Brut” denomination authorised if residual sugars are ≥ 54g/l. Banyuls “Rimage” or Rimage “mise tardive”: Complex and elegant wines with notes of small, dark fruit, delicately gourmand. Banyuls Grand Cru: these wines develop flavors of stewed fruit, spices, mocha, tobacco …; Banyuls Grand Cru can have mentions “Dry”, “Sec” or “Brut” denomination authorised if residual sugars are ≥ 54g/l.